Pfizer's Celebrex painkiller posed no more risk of heart or stroke than ibuprofen or naproxen in a large study. A panel of experts found Wednesday that Celebrex, or celecoxib, is no less safe than two other non-opioid painkillers. The drug celecoxib, which is sold by Pfizer under the brand name Celebrex, poses no greater risk for causing heart attacks and strokes than two other widely used pain relievers, the committee voted at the end of a two-day hearing. The vote was 15-5. One member abstained. Based on the committee's conclusion, the FDA may change the advice about the drug's safety that it provides to doctors. The FDA doesn't have to follow the advice of advisory committees advice but usually does. The availability and safety of alternatives to opioid painkillers have become increasingly important as the nation grapples with the deadly epidemic. 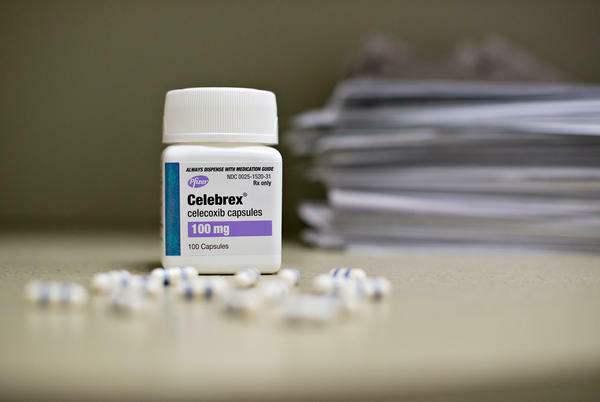 For more than a decade, some doctors have been reluctant to prescribe celecoxib, which isn't an opioid, because it is similar to Vioxx, a pain reliever that was withdrawn from the market in 2004 because of safety concerns. Both drugs are known as COX-2 inhibitors because they act by blocking an enzyme involved in inflammation. After Vioxx was launched in 1999, it quickly became a blockbuster and was used by millions of people. It was designed to cause fewer gastrointestinal complications than existing pain relievers. But Vioxx was pulled from the market in 2004 after being linked to heart attacks and strokes. A similar drug, called Bextra, was pulled from the market in 2005. 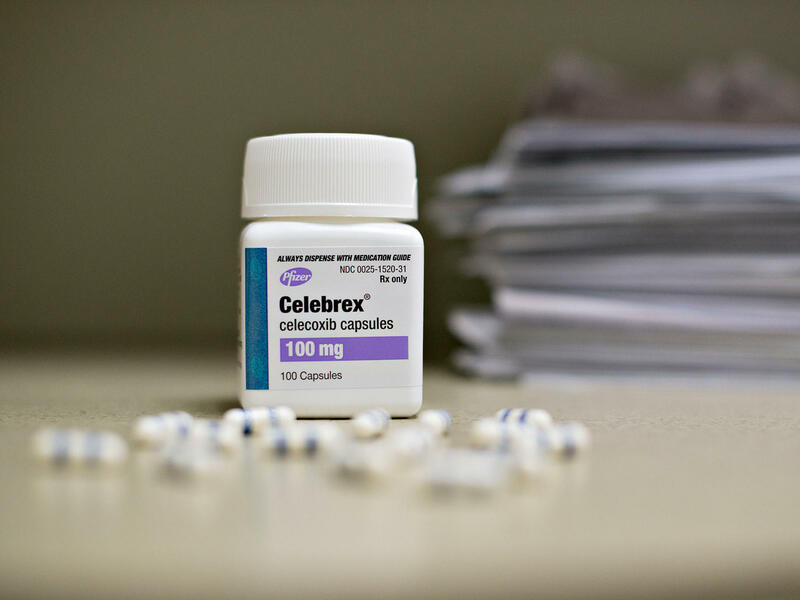 The FDA allowed Celebrex to remain on the market but ordered Pfizer to conduct a large study to examine the drug's safety. The medicine has since become available in generic forms. The FDA's committee's conclusion is based on the results of that study, which involved more than 24,000 patients with osteoarthritis and rheumatoid arthritis. 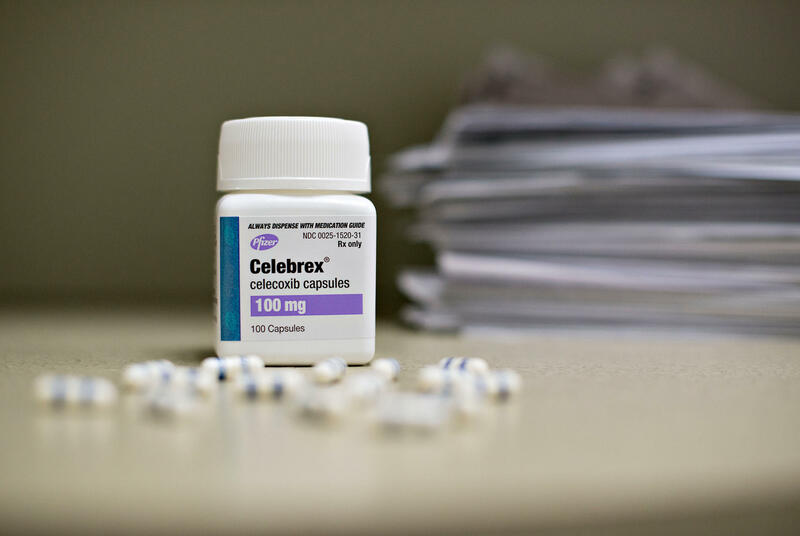 One-third took celecoxib, which is only available by prescription. One-third took prescription doses of ibuprofen. The remaining third took prescription naproxen. The study found no evidence that celecoxib poses any greater risk for causing heart attacks and strokes than ibuprofen or naproxen. Those medications are in category known as nonsteroidal anti-inflammatory drugs, or NSAIDs. Many of the committee members stressed that celecoxib isn't completely safe. The study showed it can increase the chance of cardiovascular complications. But celecoxib doesn't appear to boost those odds nearly as much as Vioxx did, or apparently even as much as prescription doses of ibuprofen and naproxen, which were thought to be safer. In fact, celecoxib was less likely to cause certain complications, such as gastrointestinal problems like ulcers and bleeding, as well as kidney problems such as kidney failure and the need for dialysis, according to the study. Some committee members questioned the significance of these findings, and the committee didn't take a specific vote on these results. Ibuprofen is sold over the counter in much lower doses as a generic and under a variety of brand names, including Advil and Motrin. Naproxen, also generic, is sold over the counter with various names, like Aleve and Naprosyn. The maximum recommended over-the-counter dose of ibuprofen is typically 1,200 milligrams daily. The study used 600 milligrams of ibuprofen three times a day, or 1,800 milligrams daily. Naproxen tablets are sold over the counter at a dose of 220 milligrams and are taken twice a day. The study used doses between 375 and 500 milligrams taken twice a day. The committee considered whether nonprescription doses of ibuprofen and naproxen can interfere with the ability of low-dose aspirin to protect people against heart attacks. Millions of people take low doses of aspirin daily to reduce their risk of having a heart attack. The committee voted 12-7, with one member abstaining, in favor or warning patients taking aspirin about the possible risk of taking naproxen at the same time. Ibuprofen also carries a warning like that, and the committee voted 17-4 against adding any additional warnings. A prescription painkiller that has been under a cloud for more than a decade is apparently safer than previously believed. That is the conclusion of Food and Drug Administration advisers after they held a two-day hearing. NPR health correspondent Rob Stein joins us now with the details. Hey, Rob. ROB STEIN, BYLINE: Hey, Ailsa. CHANG: So all right, can you just start us off by talking about the drug at issue here? What is it? STEIN: Yeah, so the drug is called celecoxib and most people might recognize the brand name, Celebrex. STEIN: It's a painkiller that people take for arthritis and other kinds of problems. And but many doctors have been really reluctant to prescribe Celebrex and that's because it's really similar to another drug called Vioxx. CHANG: Yeah, I remember Vioxx. It was pulled off the market - right? - because it was found to be dangerous. STEIN: Yeah, yeah. So Vioxx was this blockbuster drug after it came out on the market in 1999 because it was supposed to be this whole new way to alleviate pain that was supposed to be a lot safer than other drugs. It didn't cause the stomach problems that other drugs caused. But it ended up being one of the biggest debacles in drug safety history in the United States because it was pulled from the market because they realized that it increased the risk for heart attacks and strokes. CHANG: But Celebrex stayed on the market? STEIN: Yeah, that's right. The FDA let Celebrex stay on the market with lots of warnings. And it ordered the company, Pfizer, that makes the drug to conduct a big study to try to get a really good fix on whether Celebrex is safe or not. So 24,000 people with arthritis took Celebrex or another painkiller like ibuprofen or naproxen to see which was safer and which was not. And then the FDA convened this special two-day hearing this week to review the results that study makes in recommendation to the FDA about Celebrex. CHANG: So what did that study show? STEIN: Yeah, so it was surprising. The study actually concluded that Celebrex was no riskier than these other really popular drugs like ibuprofen and naproxen and in fact, you know, that it didn't increase the risk any more. And the committee voted overwhelmingly that they agreed with the conclusions of the study. Now, it's important to point out that doesn't mean Celebrex is safe. All of these drugs do increase the risk for some complications, even heart problems. Celebrex does, ibuprofen does, naproxen does. But the study showed that Celebrex was no riskier than these drugs and may actually be a little bit safer. So the committee says, you know, we should tell people about this. You know, they have this other option that might be an appropriate option for a lot of people. CHANG: OK, so then what happens now? CHANG: Oh, (laughter) I didn't know that. STEIN: No, it has the option of saying no. But this is pretty clearly a clear recommendation. And it's a big deal because millions of people rely on these drugs to alleviate pain from arthritis or twisted ankles or that sort of thing. And doctors these days are desperately looking for alternatives to opioids because we're in the middle of this horrible opioid epidemic of opioid addiction and overdoses. So the, you know, results of this could affect a lot of people. CHANG: Did the committee say anything else about these drugs? STEIN: ...You know, or a second heart attack. But there's been some evidence that taking ibuprofen or naproxen could interfere with that protective effects of aspirin. And so they wanted to know what should we tell people with that? What should we say about it? And this was a little bit more mixed. They really weren't quite sure. But they decided in the end, yeah, we should warn people taking naproxen that this could be a problem. And ibuprofen already has that kind of warning on the label. CHANG: All right, that's NPR's Rob Stein. Thanks very much, Rob. STEIN: Oh, sure. Thank you. Transcript provided by NPR, Copyright NPR.